Not exactly my first memory of a robot (I think the Daleks have that honour), but perhaps my first memory of a robot helping a human out. Or was it Rosie, the house maid in the Jetsons? Anyway, the idea of helpful robot servants has been around for a long time! 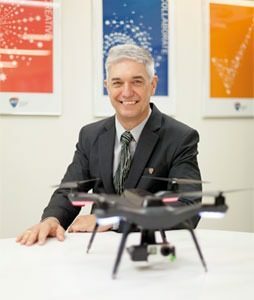 The theme for this year’s ACS Canberra Branch Annual Conference is “Drones, Droids, and Robots”, which we’ve adopted from the National Science Week theme. We’ve compiled a list of great speakers who are going to talk about how robots, automation, machine learning and artificial intelligence will be influencing our work and professional lives now and into the future. 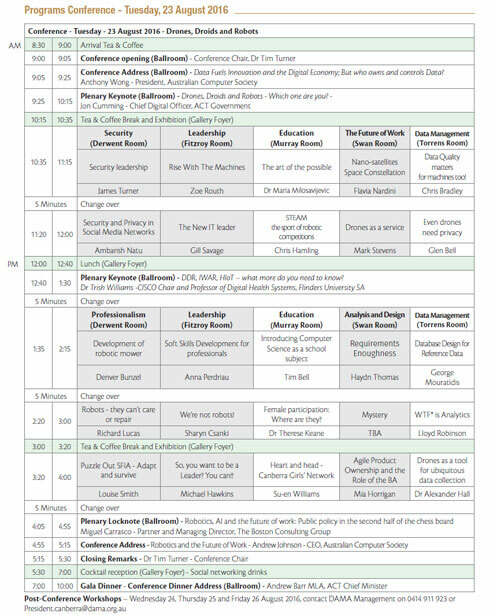 Within the conference we’ll look at questions like: what should we be teaching our children about what it means to work? How is leadership changed by an automated and possibly autonomous workforce? What issues must we consider when attempting to build systems that are expected to run unsupervised? Our gala conference dinner will be worth staying on for too. We’ll be hearing from our Chief Minister and also recognising the significant and special contributions that have been made by IT professionals in the ACS in Canberra over a long period of time. I hope that through hearing what these industry and thought leaders think about a more automated future, we will all not have to rely on our ‘friendly automaton’ protecting us as the robot in Lost In Space did for Will Robinson all those years ago. On behalf of the ACS I would like to take this opportunity to welcome delegates to the 2016 ACS Canberra Conference. For a number of years our Canberra Branch has hosted this event which brings together delegates from all over the country to discuss issues of importance to our profession, and this year is no different. 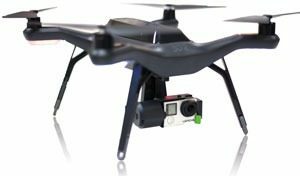 The conference theme of Drones, Droids and Robots is fitting given the increasing prevalence of autonomous technology in society. Earlier this year I was able to attend the Consumer Electronics Show in the USA and wrote at the time that cars are rapidly becoming computers on wheels. With these developments it becomes imperative to discuss the importance of professionalism and ethics in the technology field. As we rely more than ever before on autonomous systems for protection, we must be assured that those professionals designing and creating systems are doing so in a manner which keeps the public interest at the forefront. As the professional association for Australia’s ICT sector the ACS has a leading role to play in promoting and defining professionalism in ICT. By attending the ACS Canberra Conference, you are indicating that you are willing to be a part of shaping the future not only of our profession, but also of our country. I want to thank you for joining us as we undertake this important work, and I look forward to meeting you at the 2016 ACS Canberra Conference. Disabled Facilities: All public areas of the Convention Centre are accessible by wheelchair. Lifts are located in the foyers and provide access to both levels of the Convention Centre, and to the top level of the car park. Toilets: Male and female toilets, including disabled access toilets are located in the foyers on both levels of the Convention Centre. Smoking: The National Convention Centre is a smoke free venue. Smoking is not allowed inside the building. The conference theme of Drones, Droids and Robots is drawn from National Science Week. It’s application to our conference focuses on drones, droids and robots and also wraps up ideas like automation, machine learning and artificial intelligence, sensors and the internet of things, the data that arises from those sensors and autonomous machines and its analysis. We also explore the ethical issues around machine learned decision making and the behavior of autonomous machines. Security – to what extent can we rely on automated/autonomous machines for security and what threats to autonomous/automated machines pose to our IT infrastructure? Professionalism – what are the ethics of setting autonomous machines to participate actively in our society? The Future of Work – how will our jobs change as machines and autonomous software agents perform more and more of the ‘routine’ elements of all jobs? Analysis and Design – to what extent are classical methods of understanding requirements for (work) systems changed by the introduction of automated entities in the workforce/work systems? Data management – automatons and sensors generate unimaginable amounts of data constantly. How do we cope with that data burden? Leadership – Are we heading to a future where teams of people are led by robots/autonomous entities? 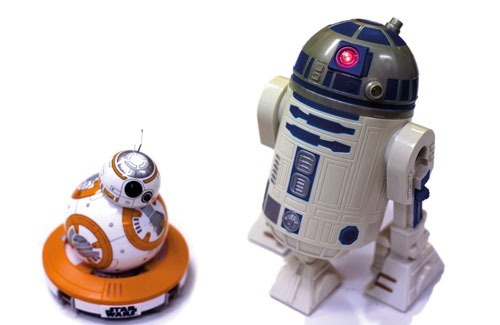 Education – how can drones, droids, and robots be used as a part of the educational process? What do people need to know to be able to create, maintain, use and optimize the exploitation of (autonomous) drones, droids and robots? Callida Consulting is a rapidly growing Canberra-based consultancy firm with over 60 experienced consultants dedicated to providing independent and professional services to the public sector in the areas of ICT consulting, financial management, assurance and audit, and management consulting. Our success is underpinned by our corporate values that enable us to focus on delivering quality outcomes for our clients and developing and supporting our consultants. We have assisted a number of agencies to measurably increase value from their ICT investment, and to manage the change associated with ICT-enabled projects. Education Services Australia (ESA) is a not-for-profit company owned by all Australian Education ministers. ESA develops shares and deploys nationally-owned education infrastructure and resources on behalf of ministers, and provides technology based services to school, higher education, and vocational education and training sectors. Take your career to the next level with IT training from Canberra Institute of Technology, the region’s premier and largest vocational education and training provider. CIT offers courses for all skill levels in areas including software development, games programming, systems analysis and design, testing, networking, cyber security and CISCO certification. UNSW has been proudly educating the future leaders of the Australian Defence Force here in Canberra for half a century. UNSW Canberra is a multidisciplinary college with undergraduate and postgraduate coursework programs and research available in Business, Management, IT, Engineering, Humanities, Science and other areas. 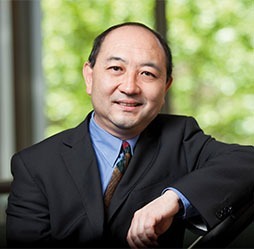 The Research School of Computer Science at ANU believes in the power of computing technologies to help solve diverse problems and transform industries. Our education and research programs combine knowledge and understanding of computer science and technology alongside experiential learning. Students are accredited through the ACS upon graduation. The University of Canberra is a high-growth, emerging university that values innovation and collaboration. It is a university with a global focus and strong international links, including partnerships with universities around the world. The University has strong emphasis on work-integrated learning and produces some of the country’s most employable graduates.